Alyssa (7 months) is wearing the Raggedy Ann costume. The costume was handmade by her Grandmother and the hair was made by me (her mom). 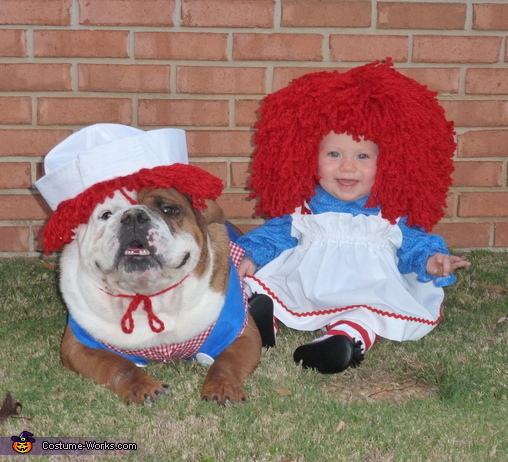 Gus (the bulldog) is wearing the Raggedy Andy costume. His costume was also handmade by Alyssa's Grandmother. Me (Alyssa's mom) and my sister (Heater) came up with the costume idea because our mom made both of us a Raggedy Ann costume when we were little. She actually still had the Raggedy Ann wig that we both wore when we were small. We decided to make Gus Raggedy Andy so he would math Alyssa for her first Halloween. We also dress Gus up every year.